The Bedouin must be made municipal workers in industry, services, construction, and agriculture. Eighty-eight percent of Israeli residents do not work in agriculture. The Bedouin will be included among them. The transition will be sharp, however. It means that the Bedouin will not be on his land and with his herd; he will be a city dweller who comes home in the afternoon and puts on a pair of slippers. His children will get used to a father who wears pants, carries no dagger, and does not remove head lice in public. They will go to school with their hair combed and parted. It will be a revolution. How can this be organized within two generations? Not by force, but with governmental direction. This phenomenon called Bedouin will disappear. The Bedouin are grabbing new territory. They are gnawing away at the countrys land reserves, and no one is doing anything significant about it. The 1965 Planning and Building Law, examined in greater detail in Chapter V, created a hierarchy of planning bodies that drew up master plans at the national, district and local level. The first Israeli master plans in the late 1960s identified existing and projected built-up areas in every part of Israel. The authorities did not acknowledge the existence of the populated Bedouin villages on the original master plans and zoned their land as agricultural. As a result, although six villages have subsequently been recognized (see below), most of these still do not have a detailed outline plan and thus cannot receive permits to build. In addition, none of the still unrecognized villages (39 in total) can apply for and receive permits to build, and all the structures, even those existing before passage of the 1965 law, the state deems illegal. Another section of the 1965 Law holds that unlicensed buildings cannot be connected to utilities such as water, electricity, or telephone networks, thus leaving all the homes in the unrecognized villages without these basic state services. Finally, the law also allowed for the confiscation of land for public purposes, which led to another round of state confiscation of Bedouin land in the Negev, including the land that the state used to build the first government-planned Bedouin townships as well as land later used to build Jewish towns and other state projects. Bedouin did not have adequate time to learn about and fulfill the requirements of the British Mandate registration process, which lasted only two months.20 This was the last time that Bedouin were able to officially register their land and it is the registry that Israeli officials have used since 1948. The 1969 law also provided a legal basis for settling disputed land title, as described below (see this chapter, section Battle over Land Ownership). The Knesset (Israels parliament) passed the 1980 Negev Land Acquisition (Peace Treaty with Egypt) Law following Israels 1979 peace treaty with Egypt in which Israel agreed to return the Sinai Peninsula to Egypt and dismantle the Israeli air base there. The 1980 Law authorized the government to confiscate specifically designated land in the Negev with no right of appeal in order to create a new site for the air base. The Law stipulated that the land would be registered in the name of the state and that the current owner or tenant should vacate the land within three months; if not, the Law authorized the government to use force to remove them. Under the framework of the 1980 Law, the state expropriated 65,000 dunams (16,250 acres) and removed approximately 5,000 Bedouin from their land.21 This land was used to build the Nevatim air base and the government-planned townships of Kseife and Arara BNegev, to which the government expected the displaced Bedouin to move. The Law codified a compensation formula that was greater than that which the government had offered Bedouin in the 1970s, but still less generous than the compensation the government gave the Sinai Jewish settlers to relocate to Israel. In 2006, 26 years later, the government threatened the unrecognized village of al-Sira, near the Nevatim air base, with mass forced evictions since the residents live on land officially expropriated by the state under the 1980 Law. The government had never previously told village residents that they lived in the expropriated area or told them to evacuate. Israel established seven Bedouin townships between 1968 and 1990, with no input from the Bedouin population, and encouraged Bedouin to move there.22 Most Bedouin assert that the government designed the townships to concentrate the Bedouin into a fraction of the land of the Siyag and to try to end Bedouin claims of land ownership elsewhere in the Negev.23 Many of the Bedouin who moved into the townships from the 1970s onwardsapproximately 85,000 of the current Bedouin population of 170,000did so in the hopes of a better life and government services.24 Those who moved were also disproportionately Bedouin who had not been landowners and had no claims to land, and thus did not have the same imperative to remain on their land. The government has neglected these towns, investing little in them. They suffer disproportionately compared to Jewish towns in Israel from food insecurity, poverty, unemployment, crime, low levels of education, and poor health. They are overcrowded, and they were built at least partly on confiscated land claimed by other Bedouin, leading to internal communal conflicts (this is discussed in more detail in Chapter VII, below). Very few Bedouin today see them as an acceptable residential option, and there are some reports that Bedouin are leaving the towns and returning to live in unrecognized villages. The Bedouin unrecognized villages, two thirds of them created since the Israeli army forced the Bedouin to abandon their historical villages and re-locate to the Siyag after 1948, exist in some of the most squalid and hazardous locations in Israel. Bedouin live next to Dimonas garbage dump, in the shadow of Beer Shevas prison, under the constant roar of military airplanes taking off from the Nevatim air base, among the giant pylons of Israels southern electric power plant, and under the noxious fumes of the Ramat Hovav chemical plant and toxic waste site. All of these facilities were built long after the Bedouin had established their homesteads in these areas. Bedouin settled the unrecognized village of Wadi al-Neam in 1956, after Israeli military authorities forcibly displaced them from their ancestral land. In the 1970s Israel built its main electric plant for the southern region in the midst of the village. 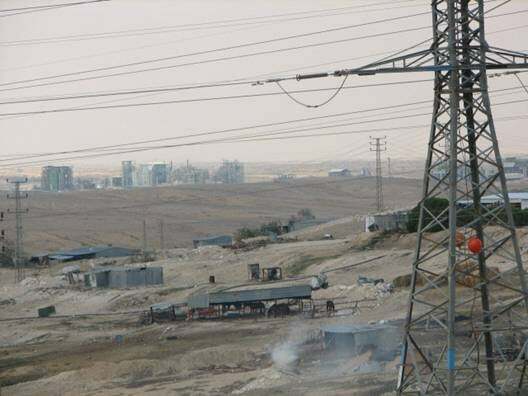 While Bedouin homes receive neither running water nor electricity, high voltage electric wires supplying residential communities nearby buzz directly overhead. In the mid-1970s, Israel built the Ramat Hovav industrial plant nearby, housing 50 percent of Israels chemical factories and the countrys only toxic waste dump. Noxious fumes pervade the area. In 2004, the Ministry of Health released a much-delayed study documenting higher than normal cancer rates and high levels of hospitalization for respiratory illness near Ramat Hovav. Yet the authorities have consistently denied the Wadi al-Neam Bedouins request to establish a new agricultural village in a different, non-toxic location. The only alternative the state has offered is a non-existent neighborhood in the already deeply deprived Bedouin township of Segev Shalom, still within the Ministry of Healths proscribed radius of Ramat Hovav. Today hundreds of families in Wadi al-Neam have demolition orders on their homes and nowhere to go. Several of the regional councils in the Negev and the Jewish National Fund (JNF) have promoted plans for attracting new Jewish residents to the Negev (the structure of local government is explained in detail in the next chapter). The Bnei Shimon Regional Council in the Western Negev states, Increasing the Jewish population of the Negev is one of Bnei Shimon Regional Councils major goals. Our vision is to double Bnei Shimon's population within ten years.42 The JNF is supporting Bnei Shimons aspirations as part of its Blueprint Negev plan, launched in 2006. According to the JNF, Over the next five years, our goal is to bring 250,000 new residents to the Negev. Seven out of a proposed twenty-five new communities have already been created. Existing communities are being strengthened with economic opportunities and improved quality of life.43 The JNF has a mandate to develop land for Jewish use only. The Bedouin community itself is divided in its approach to the problem. Some Bedouin insist that the government should de-link the issues of land ownership from the creation of adequate residential and housing options for todays Bedouin community. They told Human Rights Watch that the government conditions every positive initiativefrom staying a demolition, to granting limited compensation, to providing a plot in a recognized townshipon the Bedouin beneficiaries renouncing all claims to land. Others argue that the land question is at the heart of the problem, and that without an honest attempt to settle the question of land ownership, possession, and use in a fair and just fashion, there can be no real solution. The Bedouin have organized their own leadership over the years, and in 1997, representatives from different unrecognized villages formed the Regional Council for the Unrecognized Villages of the Negev (RCUV). The RCUVs main goal is to win recognition for all of the unrecognized villages. In 1997, the RCUV created its own master plan, the Negev Arabs Plan for 2020, and submitted it to the planning institutions and the Interior Ministry. While the RCUV was not successful in gaining recognition for its plan, it has continued in its efforts to raise awareness of the Bedouin plight and advocate for change through court cases, media campaigns, demonstrations, lobbying government and planning officials, and interventions at United Nations (UN) bodies. Most recently, on July 16, 2007, the RCUV launched a protest camp, housing victims of Negev home demolitions, outside the Knesset to protest ongoing home demolitions. Meanwhile, international allies and donors to Israel have done little to publicly acknowledge or pressure Israel to curb its violations of Bedouin housing rights. Just before the Israeli government withdrew settlers and military from the Gaza Strip in August 2005, Israel submitted an initial request for $2.2 billion in funding from the United States, part of which was to be used for developing the Negev and Galilee.51 At the time, local advocacy groups called on the US to condition any aid to Israel earmarked for developing the Negev on Israeli promises of non-discrimination.52 This Israeli aid request has subsequently been frozen. 6 Quoted in the newspaper Haaretz (Tel Aviv), July 31, 1963, reproduced in Thabet Abu Ras, Land Disputes in Israel: The Case of the Bedouin of the Naqab, Adalah Newsletter, vol. 24, April 2006. 7 Ariel Sharon, Land as an Economic Tool for Developing Infrastructure and Significantly Reducing Social Gaps, Land, December 2000, quoted in Abu Ras, Land Disputes in Israel, Adalah Newsletter. At the time of the article Sharon was leader of the Likud party, which was in opposition. A dunam is equivalent to 0.1 hectares or approximately 0.25 acres. 8 Israeli and international literature both confirm that Jewish settlement only began in the Negev in the years leading up to the 1948 War and that the Bedouin were the only inhabitants of this area for most of the pre-1948 period. See for example, Ruth Kark, Jewish Frontier Settlement in the Negev, 18801948: Perception and Realisation. Middle Eastern Studies 17 (1981), pp. 33456. In addition, both Israeli and international academics and organizations have asserted the Bedouins indigenous status. See, for example, the work of the Washington DC-based Refugees International on the Bedouin, http://www.refugeesinternational.org/content/article/detail/909/ (accessed December 7, 2007), and Israeli academics Sandy Kedar, Oren Yiftachel and Ruth Kark. 9 The Negev constitutes 60 percent of Israels land mass. There are also a few tens of thousands of Bedouin living in the north of Israel, in Galilee, who are descended from Syrian Bedouin tribes. Most of the Negev Bedouin are related to Sinai and Arabian Peninsula Bedouin tribes. 10 See, for example, Ghazi Falah, Israel State Policy Towards Bedouin, p. 36 (footnote 10). According to Falah, the 1931 Census of Palestine registered some 89.3 percent of the Negev Bedouin as deriving their livelihood from agriculture and only 10.7 percent as occupied solely in raising livestock. 11 Jeni Dixon and Leena Dallasheh, Ethnic Cleansing in the Negev, July 31, 2005, http://www.alternativenews.org/aic-publications/other-publications/ethnic-cleansing-in-the-negev-20050801.html (accessed June 15, 2007). 12 Benny Morris, Israel's Border Wars, 1949-1956: Arab Infiltration, Israeli Retaliation, and the Countdown to the Suez War (Oxford: Clarendon Press, 1997). 13 Shlomo Swirski and Yael Hasson, Invisible Citizens Israel Government Policy Toward the Negev Bedouin (Tel Aviv: Adva Center, February 2006), http://www.adva.org/UserFiles/File/NegevEnglishFull.pdf (accessed May 23, 2007), p. 12. 14 Siyag means fence in Hebrew. According to Israeli Ministry of Agriculture figures the total area of the Siyag was 1.2 million dunams (300,000 acres), located mostly east and southeast of Beer Sheva. See Swirski and Hasson, Invisible Citizens, p. 6. 15 Human Rights Watch interviews with Nuri al-Ukbi, Beer Sheva, April 3, 2006; Salim Abu Alqian, Um al-Hieran, March 29, 2006; Labad Abu Afash, Wadi al-Neam, April 9, 2006. 16 Human Rights Watch interviews with Salim Abu Alqian, Um al-Hieran, March 29, 2006 and Suliman abu Bayid, Lakiya, April 6, 2006. According to Israeli historians, around 50 Jewish settlements were built in this area in the early 1950s. See Swirski and Hasson, Invisible Citizens, p. 7. 17 According to Israeli Ministry of Agriculture figures, in 1955 about one-third of the residents of the Siyag were indigenous to the area and the other two-thirds had been displaced from the Western Negev. Ibid., p. 8. 18 Hebrew originals of these laws can be found in Sefer HaHokim [Book of Laws]. The Land Acquisition (Validation of Acts and Compensation) Law - 1953, Sefer HaHokim 122, p. 58. The Planning and Building Law - 1965, Sefer HaHokim, 467,p. 307. The Land Rights Settlement Ordinance [New Version], 1969, Ordinances of the State of Israel, New Version 13, p. 293. The Negev Land Acquisition (Peace Treaty with Egypt) Law  1980, Sefer HaHokim, 979. An English translation of the Planning and Building Law 1965 can be found online at http://www.geocities.com/savepalestinenow/israellaws/fulltext/planningbuildinglaw.htm (accessed June 15, 2007). 19 In the Negev, 137,400 dunams were expropriated under the law. 20 Ben-David, Y., Feud in the Negev: Bedouin, Jews, Land, (Rananna: The Center for the Research of Arab Society in Israel, 1996) (Hebrew).Under this law the state gained possession of about 12 million dunams, most of them in the Negev region. 21 Centre on Housing Rights and Evictions and BADIL Center for Palestinian Residency and Refugee Rights, Ruling Palestine, A History of the Legally Sanctioned Jewish-Israeli Seizure of Land and Housing in Palestine, May 2005, pp. 53-54. 22 Tel Sheva was established in 1969; Rahat in 1971; Segev Shalom in 1979; Kseife and Arara BaNegev in 1982; Lakiya in 1985; and Hura in 1989. See Swirski and Hasson, Invisible Citizens, p. 14. The Israeli government refers to Rahat as a Bedouin city and the other six townships as suburban Bedouin towns. Letter to Human Rights Watch from the Israeli Ministry of Justice, July 23, 2007, on file with Human Rights Watch. 23 The seven townships were one of the recommendations of an interministerial committee established by the government in 1962 to examine proposals for locating sites for residential construction in the Negev, including housing for the Bedouin population. In 1965 the Committee recommended that the government establish seven permanent communities in a tiny area of 7,600 dunams (1,900 acres) in the Negev. See Swirski and Hasson, Invisible Citizens, p. 13. 24 The population numbers stated here come from Swirski and Hasson, Invisible Citizens, p. 33. Many observers believe that there are actually far fewer than 85,000 Bedouin living in the townships but that Bedouin often register their place of residence in the townships in order to receive an official address for mail and to facilitate receipt of benefits. In addition, some Bedouin who previously lived in the townships have actually moved to (or back to) the unrecognized villages without changing their official place of residence. In its letter to Human Rights Watch dated July 23, 2007, the Israeli Ministry of Justice said that there are more than 170,000 Bedouin living in the Negev and that [m]ost live in urban and suburban centers. The letter later states that around 70,000 Bedouin live outside the townships, placing the governments number of people living in the townships at around 100,000. 25 Human Rights Watch interview with Khir al-Baz, Beer Sheva, April 4, 2006. 26 See, for example, Cabinet Resolution No. 2562 [Arab/47]), November 2000. The first time the planning authorities officially recognized a pre-existing village was when the Southern District Planning Commission recognized the village of Drijat as a standalone community, despite a previous government decision to just include it as a part of the planned township of Marit. The Planning Commission decided to recognize the village in January 2004. See First time recognition for previously unrecognized Negev village, Association for Civil Rights in Israel press release, February 1, 2004, http://www.acri.org.il/english-acri/engine/story.asp?id=160 (accessed May 24, 2007). 28 The process was established by the Land Rights Settlement Ordinance [New Version]  1969. 29 The Negev Coexistence Forum for Civil Equality, The Arab-Bedouins of the Naqab-Negev Desert in Israel, a Shadow Report submitted to the UN Committee on the Elimination of Racial Discrimination, May 2006, http://www.ohchr.org/english/bodies/cerd/docs/ngos/NCf-IsraelShadowReport.pdf (accessed May 21, 2007), p. 7. 30 In 1858 the Ottoman Empire introduced a system of private ownership for the first time. The system was codified in the Ottoman Land Law of 1858, which created a Tabu, or land registry, where land owners who fulfilled the criteria of the law could register their land and receive an ownership deed (also called a tabu). As explained in the text of the report, Bedouin were often reluctant to officially register land they owned or used due to their distrust of the authorities; their reliance on a traditional, not official, land ownership system; and/or their fear of taxation and conscription. 31 Swirski and Hasson, Invisible Citizens, p. 17. 33 At this writing, one New Israeli Shekel (NIS) equals approximately US$0.25. 35 In April 2003 the Special Ministers Committee for the Non Jewish Sector ordered the Israeli Land Administration to file counter claims against the lands claimed by the Arab-Bedouins. See Negev Coexistence Forum for Civil Equality, The Arab-Bedouins of the Naqab-Negev Desert in Israel, p. 7. The ILA refers to its generous offer to the Bedouin several times on its website. See http://www.mmi.gov.il/static/HanhalaPirsumim/Beduin_information.pdf (accessed June 15, 2007). 36 Negev Coexistence Forum for Civil Equality, The Arab-Bedouins of the Naqab-Negev Desert in Israel, p. 8. 60% [of the Bedouin population in the Negev] lives in seven permanent townships, and the remainder in illegal homes spread over hundreds of thousands of dunams (these scattered Bedouin localities are referred to as the Bedouin dispersal). http://www.mmi.gov.il/static/HanhalaPirsumim/Beduin_information.pdf (accessed May 21, 2007). 38 Uri Tal, Master-plans for the Bedouin Settlements in the Negev, Knesset Center for Research and Information, December 3, 2006, http://www.knesset.gov.il/mmm/doc.asp?doc=m01668&type=pdf (accessed March 25, 2007) and letter to Human Rights Watch from Ministry of Justice, July 23, 2007. 39 Human Rights Watch interview with Haya Noach, Omer, April 4, 2006. 40 Human Rights Watch interview with Talal (full name withheld), Tarabin al-Sane, April 6, 2006. 41 Information in this paragraph taken from Shlomo Swirski, Current Plans for Developing the Negev: A Critical Perspective (Adva: Tel Aviv, January 2007). http://www.adva.org/UserFiles/File/AdvaNegevJanuary2007.pdf (accessed November 16, 2007). 42 Bnei Shimon Regional Council website, http://www.bns.org.il/site/he/eCity.asp?pi=2372&doc_id=12331 (accessed May 23, 2007). 43 Jewish National Fund website, http://www.jnf.org/site/PageServer?pagename=negevindex (accessed May 23, 2007). 44 Protocol of 1/16/2007 meeting of the Knesset Internal Affairs and Environment Committee on Master plans of Bedouin settlements in the Negev and home demolitions (on file with Human Rights Watch). http://www.knesset.gov.il/protocols/data/html/pnim/2007-01-07.html [Hebrew] (accessed May 23, 2007). 45 Information taken from a letter to Human Rights Watch from the Ministry of Justice dated July 23, 2007. 46 Letter on file with Human Rights Watch. 47 Email update from Regional Council for Unrecognized Villages in the Negev, December 12, 2007. On file with Human Rights Watch. 48 Abu Ras, Land Disputes in Israel, Adalah Newsletter. 49 United Nations Committee on Economic, Social and Cultural Rights (CESCR), Concluding Observations of the Committee on Economic, Social and Cultural Rights : Israel, E/C.12/1/Add.90, May 23, 2003, http://www.unhchr.ch/tbs/doc.nsf/(Symbol)/b313a3503107f1e6c1256d33002cea38?Opendocument (accessed May 21, 2007). 50 Committee on the Elimination of Racial Discrimination, Concluding Observations of the Committee on the Elimination of Racial Discrimination: Israel, CERD/C/ISR/CO/13, June 14, 2007. 51 David R. Sands, Israel seeks U.S. funding for pullout The Washington Times, July 12, 2005. Israel later dropped their request after Hurricane Katrina devastated New Orleans and the Israelis recognized that the US would now prioritize domestic spending over development aid to Israel. 52 See, for example, Development of the Negev and Galilee for Jews Only? A Proposal for equal development for Jews and Arabs in the Negev and Galilee, Sikkuy Policy Paper, July 2005, http://www.orwatch.org/maakav-en/Negev%20Galilee%2023.08.pdf (accessed May 23, 2007).